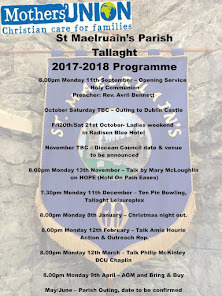 8.00pm - MU opening service in St. Maelruain’s, Rev Avril Bennett at St Maelruains Church of Ireland, Main St, Tallaght Village. Saoirse would like antibacterial hand wash as our September donation. 7.00pm- 8.00pm - Girls' Brigade starts back in the Parish Hall on Wednesday 10th September for Juniors, Seniors, Brigaders and Associates (girls aged 9 years and up) with registration from 7pm to 8pm. Normal GB will resume for these age groups on Wednesday 17th September from 7.30pm. Bible Study cancelled due to Alpha Conference. 10am - Bring Buy Sale, Coffee Morning, Megeough Home, 10am–12.30pm. 10.30am - Girls Brigade Registration for Explorers (under 9 years)will take place on Saturday 13th September at 10.30am, with normal GB for this age group (under 9's) resuming on Saturday 20th September from 10.30am to 12.30pm. Anyone interested in joining can contact Captain Fiona Monahan on 086-8519163, or just come along to registration. 3.15pm - United Society (for the prorogation of the Gospel) 300th anniversary Service in St. Patrick’s Cathedral. September at 7.30 pm till 10pm. Our nights for bowls are Tuesday and Saturday. We are looking forward to our new season with our captain Ann Kane. 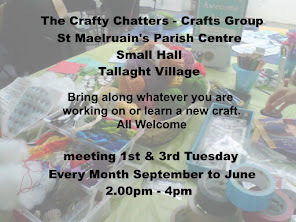 New members welcome, contact Ann Kane 086-1210039. 7.30pm - Normal Girls Brigade will resume for Juniors, Seniors, Brigaders and Associates (girls aged 9 years and up) groups on Wednesday 17th September . 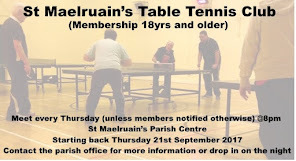 8.00pm-10pm - The table tennis club will re open on Thursday 18th September at 8pm. We play table tennis on an informal basis with the emphasis on fun and enjoyment. Experience not necessary, everybody is welcome to come along and learn. We have players of all standards in the club so there are plenty of people on hand to teach the basics. Why not give table tennis a try this year, a fun way to keep fit! Open to anybody over 18 years of age. St Maelruains Parish Centre, main hall. We look forward to seeing you. For further information ring Regina at 086 1255161. The Boys Brigade session will begin on Friday 19th September at 19.30hrs at the parish hall. Anchor section will run until 20.45hrs, Junior section will run until 21.00hrs and Company section will run until 21.30pm. We are looking forward to welcoming back all the boys and looking forward to meeting any new boys to all sections. 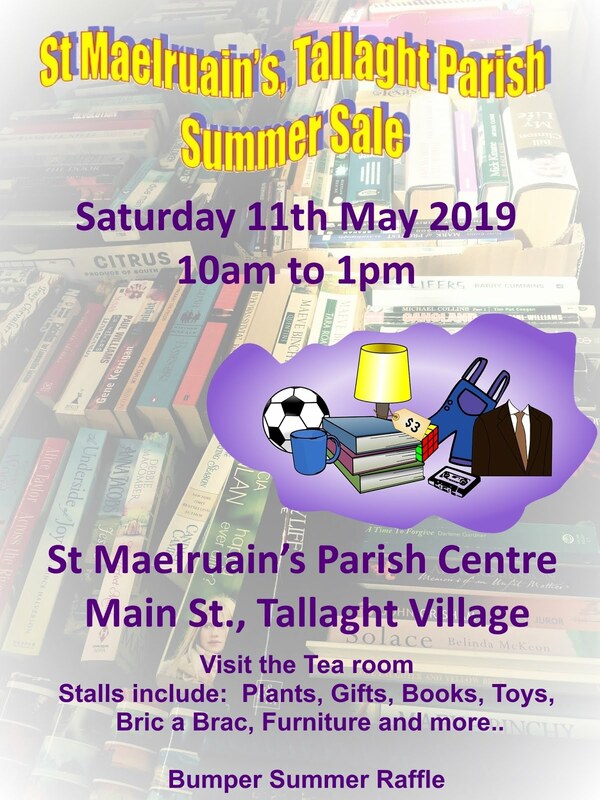 For more information contact the parish office. 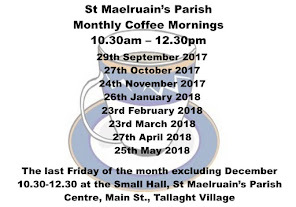 10.30am - Our last Friday of month Coffee Morning reunions begin again on Friday morning the 26th September at 10.30am. 3.30pm - We are delighted that the Christchurch Cathedral Choir with be coming to us for the evensong service at 3.30 pm. It will be only the second time they have come out to the parishes for evensong so it will be lovely to welcome them for St. Maelruain’s Harvest. We will also be delighted to welcome back former rector Rev. Robert Kingston, currently chaplain at the Megeogh home, to preach.